The Crowne Plaza Ravinia is located in a very central, easy to access, location just off I-285 (the Perimeter highway) in an area called Perimeter Center, Dunwoody. It is located within a shopping and working area just to the north of the city. It is easily accessible by car or mass transit (MARTA). Follow signs inside Hartsfield-Jackson Atlanta International Airport to MARTA. Take the NORTH SPRINGS TRAIN (red line above) northbound into the city. 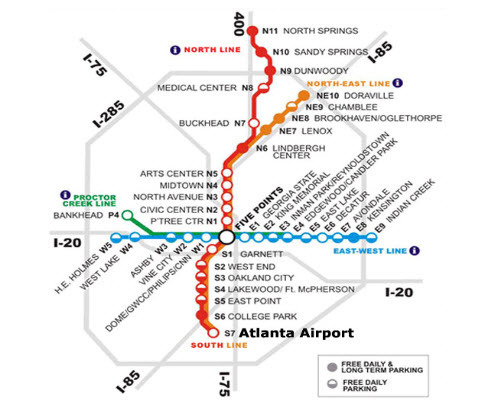 During peak hours, the red line goes directly to Perimeter Center Station (Dunwoody or N9 on the above map). During off peak hours, you may be asked to step off the train at Lindbergh Station and catch the next northbound train on that very same track. The trip takes about 30-40 minutes. The cost is $2.50/ride plus a $1.00 fee for the reloadable Breeze Card. Please note that you must use the card to enter and exit MARTA at all stations. 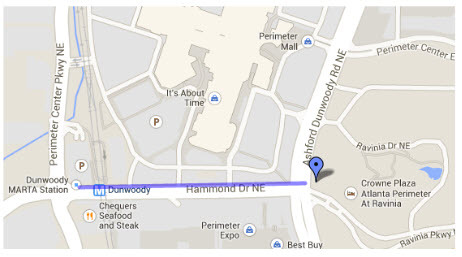 The Perimeter Center/Dunwoody Station is only 800 feet from the Crowne Plaza Hotel. If you do not want to walk from the station to the hotel, there are two FREE shuttles that run in the local area. The local business community runs the complimentary Ravinia Shuttle during the week: Monday through Friday from 7:00am – 6:00pm. It runs a loop approximately every 20 minutes. To locate this shuttle, get off the train at the Dunwoody Station. Go down one level and through the turnstiles. Turn right and go down to the street level. Exit on the mall side of the station just past where the MARTA buses pick up. The second option is the Crowne Plaza’s personal complimentary shuttle that will take you anywhere within a three mile radius of the hotel. This shuttle runs seven days a week from 6:00am-12:00am. All transportation requests are on a first come first serve basis. When you reach the Dunwoody Station, call the hotel’s front desk and they will come pick you up. Most Atlanta hotels do not have free shuttles that run to the airport. The city has restricted hotels from providing this service due to the large amounts of traffic in and around the airport area. However, there are paid shuttles available. Whether you are renting a car at the airport or driving in, the hotel is easy to find as it is located directly off one of Atlanta’s major highways. Here are the directions. 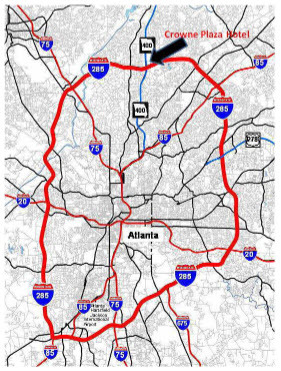 Traveling EAST on I-20: Take exit #51B (I-285 NORTH). Proceed to Exit 29 (Ashford-Dunwoody Road), turn LEFT on Ashford-Dunwoody Road and cross the bridge. The Crowne Plaza Ravinia will be on your immediate RIGHT. Traveling SOUTH on I-75: Take exit for I-285 EAST. Proceed to exit 29 (Ashford-Dunwoody Road), turn LEFT on Ashford-Dunwoody Road and cross the bridge. The Crowne Plaza Ravinia will be on your immediate RIGHT. Traveling NORTH on I-75: Take exit for I-285 EAST. Proceed to exit 29 (Ashford-Dunwoody Road), turn LEFT on Ashford-Dunwoody Road and cross the bridge. The Crowne Plaza Ravinia will be on your immediate RIGHT. Traveling SOUTH on I-85: Take exit for I-285 WEST. Proceed to exit 29 (Ashford-Dunwoody Road), turn LEFT on Ashford-Dunwoody Road and cross the bridge. The Crowne Plaza Ravinia will be on your immediate RIGHT. Traveling NORTH on I-85: Take GA 400 North (Exit 87, toll road). Go NORTH to I-285 EAST. Proceed to exit 29 (Ashford-Dunwoody Road), turn LEFT on Ashford-Dunwoody Road and cross the bridge. The Crowne Plaza Ravinia will be on your immediate RIGHT. However you’re arriving, we cannot wait to see you!